A legal definition of medical or clinical negligence/malpractice would be an act carried out by a medical professional, or any lapse in providing treatment of a patient that falls outside of recognised medical practices, resulting in harm to the patient. 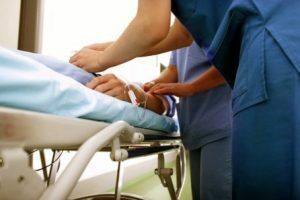 Medical negligence can be seen to be similar to professional negligence, dealing specifically with members of the medical profession and the healthcare establishments which employ them, be they state-run or privately operated. Typical examples of types of medical negligence would be misdiagnosis, mistreatment, wrongly prescribed medication, surgical accidents/errors, injuries caused to patients through lax care, (such as allowing a patient to fall out of bed), and failure to provide treatment in a timely manner. In order to successfully sue a medical professional or healthcare service for medical/clinical negligence, the following three facts must be proved. That the perpetrator of the medical negligence had a duty to care for the health of the victim. That failure to fulfil the duty of care resulted in a negative impact on the health of the victim. That the failure in duty could have been avoided. If you believe that your negligence case can prove these three facts to be true, then Legal Expert can help you claim the compensation you are entitled to. We have a proven track record in winning difficult negligence cases for our clients, and in securing the maximum amount of compensation possible. How to Find the Best No Win No Fee Medical Negligence Solicitor for Your Needs. If you have been the victim of some form of clinical and medical negligence in Stockport, then it is vital that you find a skilled negligence solicitor to pursue your compensation claim for you. No medical professional wants a black mark on their resume from having been found guilty of medical negligence. Therefore, any solicitor you decide to use must be ready to fight a complex legal battle in order to win your case and ensure you receive the most compensation possible. Legal Expert offers our nationwide claims service for victims of medical negligence in Stockport to take advantage of. We have proven time and time again we have the expertise to take on a major organisation like the NHS and win. If you would prefer to check out some local solicitors first, then here are some tips on trying to find a good one. Solicitors Reviews, What to Look For? A good starting place when you are trying to find a reputable legal firm is to search for some online reviews. These types of consumer reviews are generally fairly accurate. However, it is important to remember that sometimes reviews are faked, so don’t rely on them entirely. You can check with friends and family to see if they have dealt with any local solicitor’s and ask for their opinion as well. Does the Location of the Medical Negligence Solicitor Matter? There is no real reason to use local Stockport medical negligence solicitors. You can use phone, email, etc. to keep in touch with as legal firm anywhere in the country. You may need to arrange for a local medical examination to support your compensation claim, and this can also be organised by a solicitor anywhere in the UK. Legal Expert recommends our nationwide claim service to Stockport residents. We can organise a local medical professional to give you an examination at a time and place that suits you best. The national claims service that Legal Expert offers residents of Stockport is, we believe, a much better option than using local solicitors in Stockport to make a compensation claim for medical negligence. We have over 30 years’ of experience in representing our clients in some of the most complex types of medical negligence cases, successfully winning significant compensation pay-outs from major organisations such as the NHS. Below we have detailed some of the types of negligence cases we have tackled previously. If you have suffered due to medical negligence as an inpatient of either the Stepping Hill NHS hospital or the privately-operated Alexandra Hospital, then we can help you claim for medical negligence that happened in Stockport. Hospital negligence comes in many forms. It could be due to something major such as a badly performed surgical process. It could be something minor, such as a patient being left unattended, causing them to sustain an injury by falling over. The severity of medical negligence covers a similarly wide spectrum, from simple cuts and bruises to in extreme cases, death. No matter how minor you think your negligence case is, Legal Expert will always approach your compensation claim with complete diligence and commitment to winning you the maximum amount of compensation possible, as quickly as possible. A patient at a dental practice can become the victim of medical negligence in a number of ways. For example, they may be injured during a badly performed surgical procedure, they could be harmed by incorrectly administered aesthetic, or they could develop a jaw infection due to the instruments used not being clean. Furthermore, many physical injuries incurred at a dental surgery will have a cosmetic element such as facial scarring. Any claim for compensation will need to factor in the long-term effects of this cosmetic injury upon the life of the patient. Legal Expert can provide residents of Stockport with legal representation in such cases, making sure that all aspects of the injury are claimed for, including psychological trauma caused by having to come to terms with facial disfigurement. Your GP is the gatekeeper to the rest of the UK healthcare system. The first point of contact you have when you fall ill. Due to this, if a GP makes a fundamental mistake in the diagnosis of your condition, you could potentially receive the wrong treatment, which could be harmful to your health. Legal Expert can arrange for you to receive a local medical examination, the results of which can be used to help prove that your GP is guilty of clinical negligence, and therefore liable to pay compensation. As one of the more serious forms of medical negligence, cancer negligence cases are something we always take extremely seriously here at Legal Expert. In advanced cases of cancer, any delay in receiving proper treatment can make the difference between a full recovery being possible, and the victim losing their life. A simple misdiagnosis can be a life-threating mistake. If you have been the victim of cancer negligence, or you have lost a loved one due to cancer negligence, then you can rest assured that the Legal Expert claims service will attempt to win you the most compensation we can. One of the most common types of negligence cases we handle are care home negligence cases. It is an unfortunate fact that many care homes are underfunded, with staff overworked. Due to this, despite best intentions, accidents can and do happen. If you or a relative has been the victim of care home negligence, Legal Expert can help you establish a viable case to claim compensation. Fortunately, medical negligence during childbirth is a relatively rare occurrence in the UK. However, when it does occur the consequences can be dire. For example, should the umbilical cord become kinked or pinched during the birth, the baby will lose its oxygen supply. It only takes a couple of minutes for this to cause brain damage, affecting the infant for the rest of their life. The mother can also be injured, most usually in the form of tears or cuts during the birth, although it is not unknown for a mother to receive a serious injury such as a fractured pelvis during childbirth. Legal Expert can help family members of a mother or baby that has suffered due to medical negligence in childbirth to claim the maximum compensation possible. The table below shows that healthcare services in Stockport pay out a significant sum in compensation each year for medical negligence. You will see the number of incidents recorded and the total compensation paid. Legal Expert can offer residents of Stockport a risk-free way to make a claim for medical negligence. We can offer to take your case on as a No Win No Fee claim. When you use a no win no fee medical negligence solicitor it means you really have nothing to pay until your case is won and the compensation has been paid to you. There is no cost to begin the claim, or during the claims process, and if you don’t win, you don’t pay a thing. Before you talk to solicitors in Stockport, you should give Legal Expert a call on 0800 073 8804. We are happy to provide you with some free advice on how to make your medical negligence claim, and once we have taken all the details of your case, we will likely offer to take on your claim under a No Win No Fee agreement. If you have been the victim of a surgical error, then you may find the guide above to be useful. People who have suffered some form of cosmetic injury due to medical negligence at a dental practice might find the above information published by the NHS useful. Who is liable for psychiatric illness? The above link is a useful resource for people who are trying to discern whether their psychological illness was caused by medical negligence.